A Homemade or Crafted Solution is a bed that either you or another person builds to your specifications, usually out of wood! How difficult can building a bed be? Most of the beds that you have slept on have had wooden frames right? Maybe not. Did you ever look closely to see if there was a steel frame inside that wooden frame? Many modern frames use a hidden steel frame on the “under the bed” section. Why should that matter? If you are modeling the bed that you are making after a lightweight wooden bed, with a hidden metal frame, you may find yourself crashing to the floor. Understanding materials is a very important part of building a wooden bed. What is there to understand about wood? Have you ever loaded up a wooden bookshelf with books only to watch it sag in the middle? That is because the grain of the wood, or the plywood, is at a 90 degree angle to the force that is being applied by the weight of the books. The wood is not thick enough to resist the weight of the books. In order to have a comfortable and safe wooden bed you need to either use heavier pieces of wood, or you have to use the natural properties of the wood to their best advantage. Let me show you what I mean. If we use a board that is 1 inch by 6 inches by 7 feet, and place it flat, and then place a 50 pound weight in the center of it, it will bend severely, or maybe even break. This board is in tension. 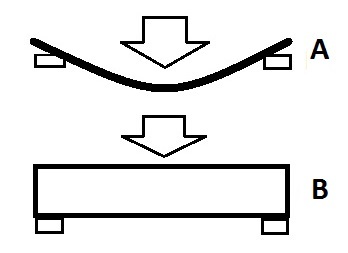 Image A shows the board set up and bending from the weight (indicated by the arrow). 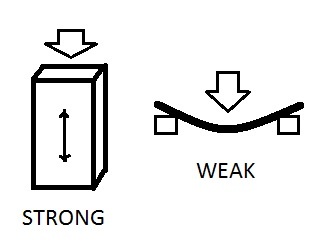 The same exact board, placed so that the weight is pressing down on the widest dimension of the board will not bend easily and should not break. Essentially you need to either use a piece of wood in compression, or use a larger dimension in the direction that the force is in. But why is this important? Well, first of all we don’t want our bed to break while we are in it, and second we generally want to be able to keep the weight of the bed as reasonable as possible. Another VERY important issue is the type of wood that you use. Inexpensive pine boards, with knots, are easily available at home improvement stores. They are weak and often split after just one use. You want to buy the best quality wood that you can afford. Our larger beds (Full and Queen sized) have all been made from oak. My daughter’s single bed was made from pine and poplar (a less expensive hardwood) and has held up well, but we were still careful to choose boards without splits or knots. Next time we will discuss options for springs, and options for assembling the boards into a bed. This entry was posted in Camping by Eirny. Bookmark the permalink.